A super-organism is helping biofuels company Mascoma Corporation lower its cellulosic ethanol production costs.The company is currently validating the process on a near commercial scale,at a $30 millionpilot plant in New York State. Sometimes advances in alternative energy are slow in coming, and other times the advances can move the industry ahead very quickly-and have the potential to make a huge impact. Mascoma Corporation has engineered a super-organism that combines two processes into one, thus reducing the cost of ethanol production from hardwood residues by requiring lower plant construction costs, less energy, and reduced operating costs. This development is being described as a game changer for the entire industry. The company is using the super-organism as part of a proprietary cellulosic ethanol production process called consolidated bioprocessing (CBP). To validate the process on a near commercial scale, Mascoma has constructed a $30 million pilot plant in Rome, New York, in partnership with New York State. Mascoma is now concluding negotiations for the construction of America's first commercial-scale cellulosic ethanol production facility within the next year. It will be located in Kinross, Michigan. "This is a true breakthrough that takes us much, much closer to billions of gallons of low-cost cellulosic biofuels," says Michigan State University's Dr. Bruce Dale, who is also editor of the journal, Biofuels, Bioproducts, and Biorefineries. "Many had thought that CBP was years or even decades away, but the future has arrived. Mascoma has permanently changed the biofuels landscape from here on." Mascoma has patents on the super organism and what it does in the cellulosic ethanol production process. The company has generated in the range of 40 to 50 families of patents. Alan Belcher, Mascoma senior vice-president of operations, says the pilot plant has been licensed strictly as a research and development facility and is capable of producing 200,000 gallons of ethanol annually. It is essentially a 1/50th size scale of a commercial plant. Although they have produced E85, product cannot be marketed from this facility. "We are using the pilot facility to guide us in our design of a commercial facility," says Belcher. "Wherever we've found that we had knowledge gaps, we've used the pilot plant to fill those gaps." They have been doing very focused, very directed research at the pilot plant. At present, researchers are conducting an extended validation run of CBP at the pilot plant for 1000 hours. Ethanol is being produced using a typical commercial production scenario to prove that the process will work continuously at predicted rates. Belcher says this is the final step before pursuing full commercialization. New York State has been a notable supporter of the technology and pilot plant, with financial support offered by the New York State Department of Agriculture and Markets and the New York State Energy Research and Development Authority (NYSERDA). David Paterson is keenly interested in developing biofuels using the state's substantial woody biomass resources to replace fossil fuels for energy security and reduce fossil fuel-related greenhouse gas emissions. The Griffiss Technology Park in Rome was an attractive location for the pilot plant. A decommissioned air force base located east of Syracuse, it has been turned into a technology park. "We found that it had lots of infrastructure for us, and lots of services to satisfy our needs," says Belcher. "We were able to find an empty shell of a building and very rapidly went ahead and put our equipment in." The super-organism-called a cellulose-fermenting thermophile- breaks down cellulose into sugars and produces large quantities of ethanol in a single step versus the multiple step processes of competing companies. 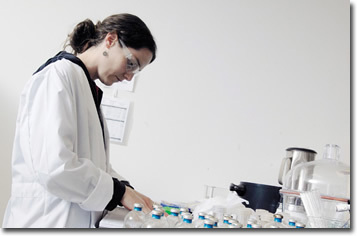 Of the company's current 90 employees, 35 are PhD scientists. In fact, Mascoma Corporation's founders are Dr. Lee Lynd of Dartmouth College and Dr. Charles Wyman previously from Dartmouth, but currently employed at the University of California, Riverside. "Both men decided that there was enough cellulosic ethanol technology developed at various places, especially at Dartmouth, that it was time to put it all together," says Belcher. "They started a company called Mascoma in 2006. That is what Mascoma is all about-commercializing all the university-generated intellectual properties probably developed over the last two to three decades." Dr. Lynd, in particular, has been working for a number of years on the CBP concept, which along with the development of a super-organism, is the cornerstone of Mascoma's technology. 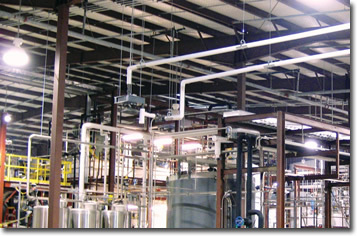 The pilot plant produced its first alcohol in June 2008, and in December 2008, it fueled its first flexfuel vehicle with cellulosic ethanol E85. Like other ethanol production processes, the hardwood feedstock used in Mascoma's method undergoes a pre-treatment, which in this case means debarking pulp quality logs to create wood chips before they go into the digester. The pulpwood logs are common species such as maple and birch that grow in the Great Lakes basin-the same logs that are harvested and delivered to pulp mills in New York's logging industry. Belcher explains that hardwood chips were chosen because of the abundant supply, particularly as a number of pulp mills have shut down. There was also an established infrastructure to deliver the logs to the pilot plant. This is a massive feedstock logistics advantage for the company, he says, over competitors using agricultural waste, emphasizing that the company would never harvest more wood than is growing to replace what is harvested. The chips are then transported to a digestion vessel. Typically in conventional ethanol production, the digested material will undergo hydrolysis, a process that adds enzymes to the raw material to help break down the cellulose into sugars-which can take up to 100 hours of holding time. Belcher says the process developed by Mascoma allows them to skip the enzyme additive stage and jump directly into a combined hydrolysis and fermentation stage from the digester. They do this with a super-organism called a cellulose-fermenting thermophile that breaks down the cellulose into sugars and produces large quantities of ethanol in one step, taking up to 100 hours to turn the cellulose into alcohol. "Our competitors don't use CBP-they are biological," says Belcher. "They use a separate enzyme treatment to produce sugar from cellulose and then, in a second step, they do the conventional fermentation using yeast to turn sugar into alcohol. So we have one step that is missing and that leads us to, we think, better economics. We don't use enzymes that the other companies have to buy, and they are extremely expensive. They can contribute $1 to the cost of a gallon of ethanol." Furthermore, alcohol production from using the engineered thermophile was reported at nearly six percent in the fermentation 'beer' in 2009, which was 60 percent more than reported just one year earlier. This is indicative of advances made by scientists working to develop this technology. The company has been working to perfect the super-organism since 2006. "The organism development is focused on improving the efficiency of conversion of cellulose to ethanol with a minimum of waste products, a minimum of energy input, a minimum of water use, and just getting the efficiency going," says Belcher. "The organism is key to a lot of that because as it works faster, our equipment gets smaller. As it produces a better yield of alcohol per ton of biomass, then the cost of the plant and ethanol production gets lower." Mascoma is careful to protect its discoveries. "We have a number of patents on the organism and what it does," says Belcher. "We are very well protected there. I think we have in the range of 40 to 50 families of patents that have been generated." Additionally, there are no fossil fuels involved in the production process, as the lignin and bark byproducts from the wood-based cellulose are burned in biomass boilers, which produce enough steam for the production process and enough power to operate the pilot plant. The company's plan is to perfect its knowledge of ethanol production from hardwood chips and then move quickly to using other available feedstocks where the cellulose is similar to wood. This could be such non-food cellulose sources as softwoods, switchgrass, or agricultural residues such as corn stover. Belcher says the company has not excluded any non-food feedstock as a potential raw material. In addition to experimenting with other feedstocks, the company intends to build on its knowledge related to engineering super-organisms. "We are also focused on making bio-products other than ethanol, using the same organism concept where we take the same feedstock, produce sugars from cellulose but instead of the organism converting it to ethanol, it could convert it to another alcohol like propanol," says Belcher. 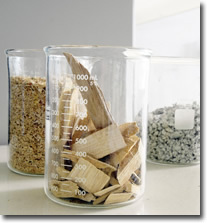 In doing so, this would open up markets for biomass replacements for fossil fuel-derived plastics. This is in keeping with the company's focus on remaining a technology company. "We are not operators," says Belcher. "We will partner with strategic partners who have operating capabilities. In fact, our first commercial plant is of that nature." He says that Mascoma is a company of scientists and engineers that will license its technologies. They will remain situated in close proximity to proposed commercial plants and have partial ownership in some of them so that they can monitor plant production and performance while continuing to improve process efficiency. The work the company has done developing its super-organism can also be used to improve the efficiency of corn ethanol plants. "I think licensing of our technology for building of ethanol plants will go on at a very rapid pace for quite a few years," Belcher concludes.